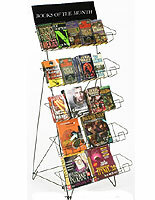 This wire display enhances point of purchase sales. 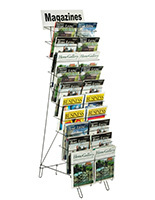 Durable and cost-effective, the tall display rack captures customer attention. 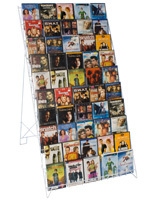 This wire display, also known as a display stand, organizes and promotes your merchandise. 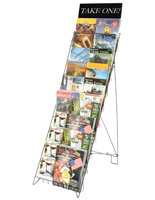 The design encourages customer browsing and selection of publications. 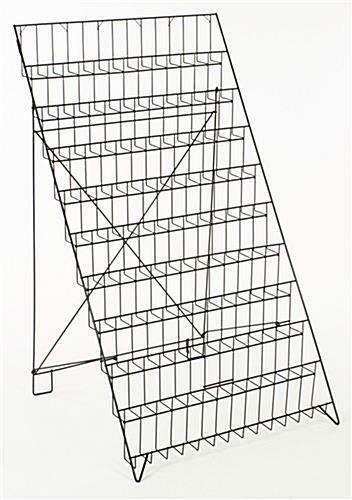 This wire display is an open shelf design. 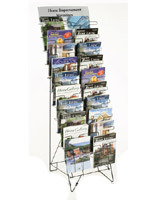 There are 10 rows with 27" wide pockets for displaying a variety of items. 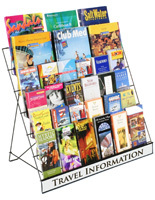 This retail rack can be used to promote books, magazines, CD's or other merchandise that fits into the 2-1/2" deep pockets.Finished in gloss black, this wire stand fits almost any decor. 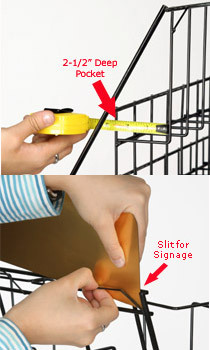 A sign slot is provided at the top of the wire rack for insertion of your signage (sign not included). The "Financial Information" sign pictured is only an example of what your sign might look like. 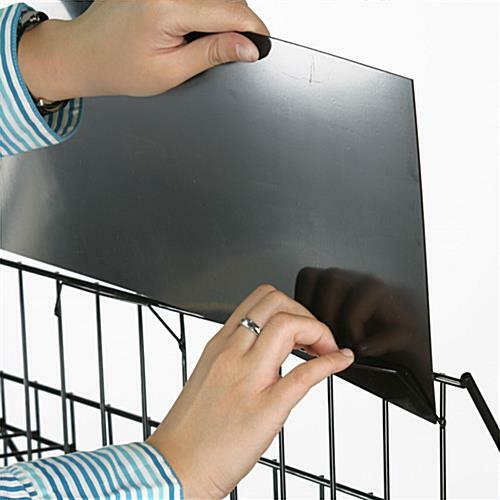 Portable, this wire rack can be folded for easy storage. It takes less than a minute to assemble. 29.0" x 47.0" x 28.0"
27.0" x 3.9" x 2.5"
20.0" x 5.0" x 0.03"
Holding up so far. Did have one that the welds came apart but we fixed it ourself. This looks great, Ashley! Thanks so much for snapping a photo! We are sorry you didn't like your purchase Wendy, one of our customer care representatives will reach out to you shortly. 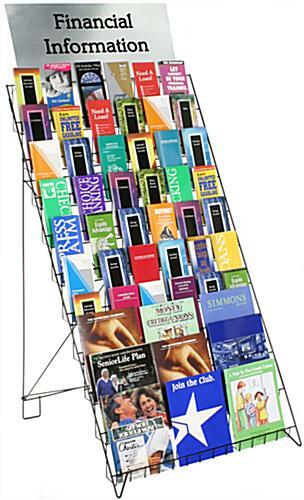 We have ordered many of these racks over the years. They are well made and delivery is fast and always on time. 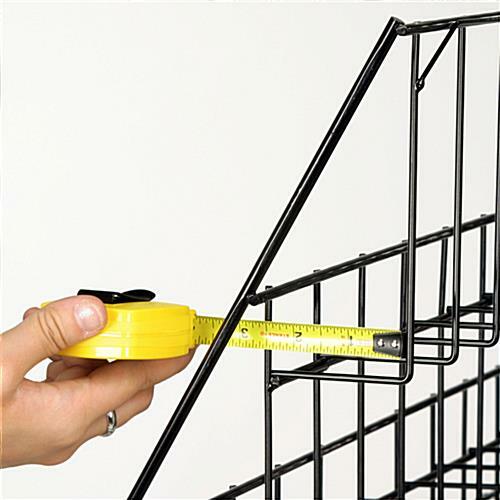 Dealing with Displays To Go is always effortless, keep up the good work. I was pleasantly surprised that this came to us completely assembled and ready to go! It's lightweight, and very convenient. Perfect for our needs! I work at a United Way, and we are using it to display information about our funded partners, and resources available in our community! We are glad you were so happy with your order, Kelli! Thanks for the feedback. 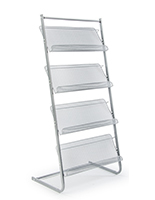 I bought this hoping for it to hold books for a book fair. The edge on each of the shelves is too short about 1inch and the books continually fell off like dominos when someone reached for them or attempted to put them back. If the edge was taller on each shelf it would be an awesome system. I was disappointed and will attempt to make it more functional by adding ribbons, rope, or a plastic board to create a barrier on each shelf. Hi Ashleigh, We are sorry to hear that your rack is not working out. Please feel free to contact us if we can be of any assistance. My guess is you are using it with thicker books. I use them for 5 shows a year and LOVE them. We average 50 racks per show and have maybe 3 titles that fall because they are to thick. Posted 2 years ago by Terry H.